One of the many fun things about working for ACH Food Companies was being able to “play” in the research & development kitchen. I just love “inventorizing” recipes for different occasions. 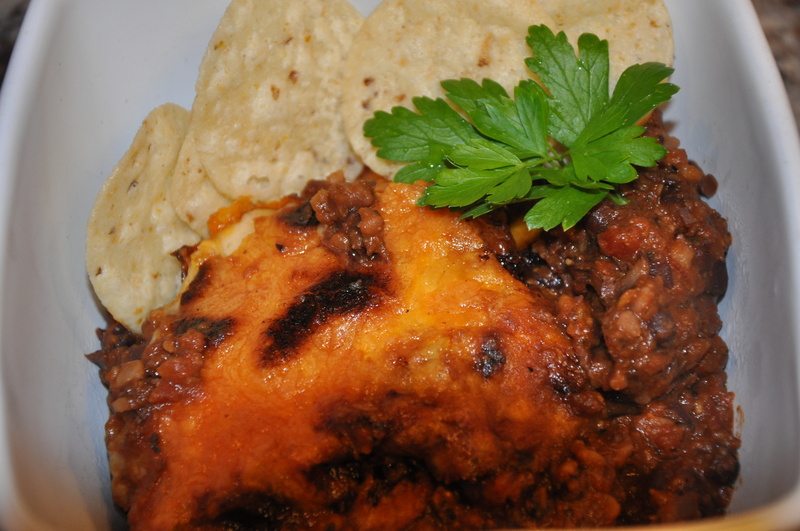 I created this recipe just for my boss at the time, Fulya Eren, and used it not only as a dip but also as a pizza sauce. If you don’t have a food processor, you can also use a blender. 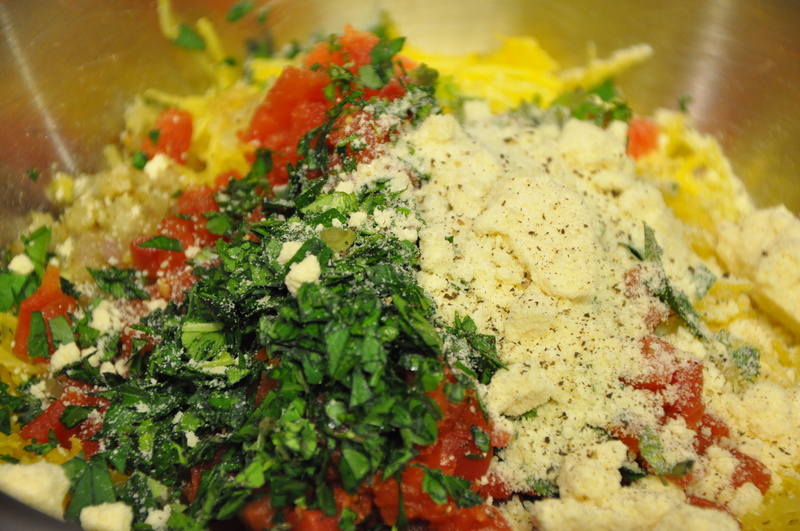 Place all ingredients in bowl of a food processor, blend until well combined, about 1-2 minutes. Serve with crackers, chips or with fresh vegetables. One of my favorite appetizers is Caprese Salad Skewers. These delightful little gems are so easy to make and so yummy to eat. Skewer with one mozzarella ball and one cherry tomato. Repeat with remaining cheese and tomatoes. Place skewers on a serving platter, drizzle with balsamic glaze, chopped fresh basil, salt & pepper. It has been a long time since I posted anything on my blog. Thanks to one of my blog followers that was at a “Gail’s Pizza Parties” last week who told me she really liked my blog posts and misses them, I am now dedicated to returning to blogging and adding new recipes weekly! I thought I would share my recipes from “Cookin’ For A Livin'”, a cookbook developed by myself, my boss at the time, Pete Friedman, and an amazing photographer, Jon Hunter. Baked Olives & Grilled Bread is one of my favorite recipes that I developed in the lab/kitchen. Not only is it an easy dish to prepare, it is also very colorful and healthy! 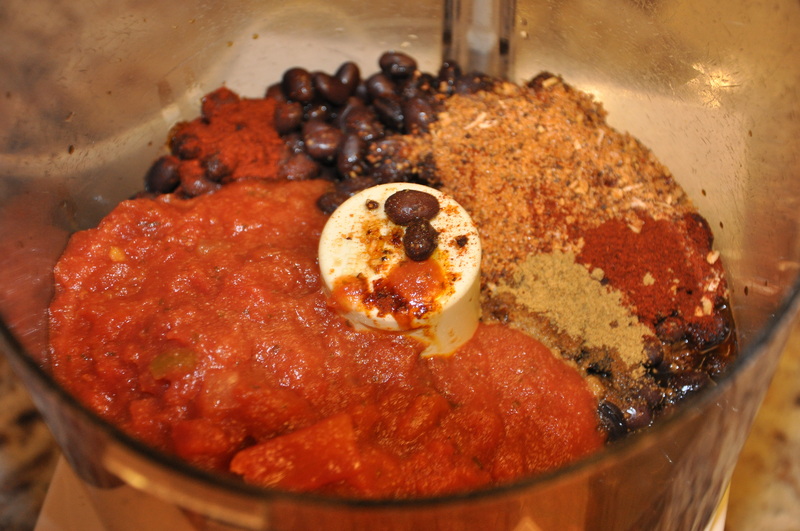 Combine black beans, salsa, burger seasoning, Worcestershire sauce, chipotles, adobo sauce, cumin, and oil in a blender or food processor; pulse until blended but still chunky. 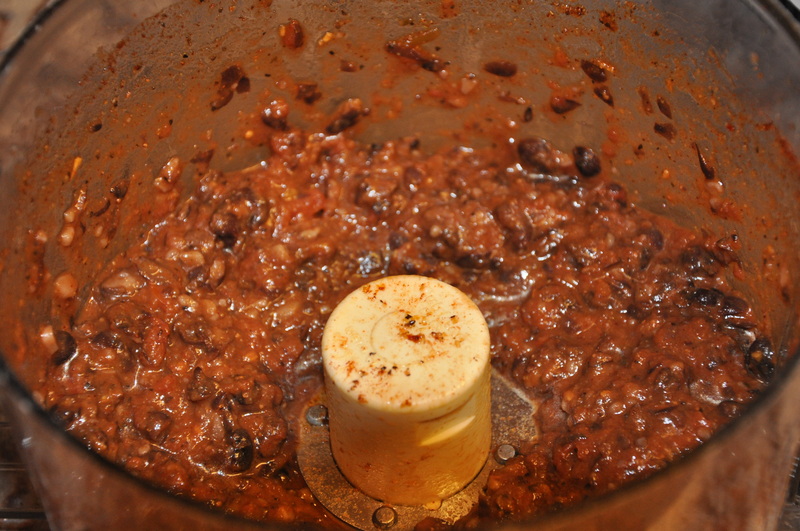 Place bean mixture in a two-quart casserole dish. Top mixture with shredded cheese. Bake in a preheated 375 degree oven for 15-20 minutes or until slightly golden and bubbly. Serve with chips for dipping. Note: Tonight when I made this dip I was out of canned chipotle peppers, so I substituted 1 tablespoon Chipotle Pepper Seasoning and 1 teaspoon of liquid smoke! It rocked!!! 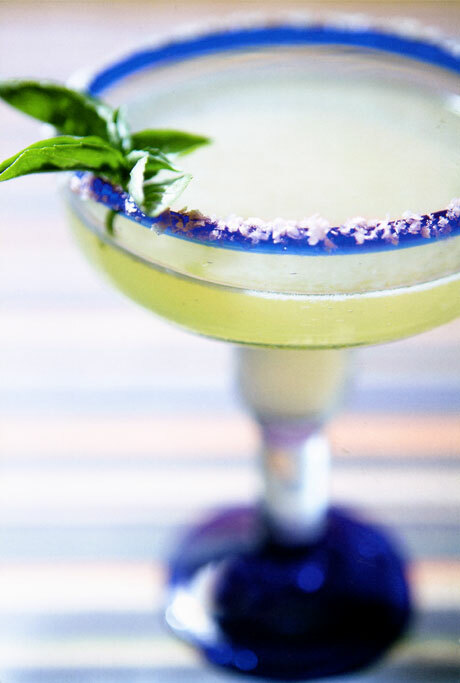 Rub the outside of 1 glass with cut lime. Dip into a plate of Kosher salt. and pour into prepared glass….. This one is for all my gluten free and vegetarian friends…an easy and very flavorful side dish, or even as a main meal. 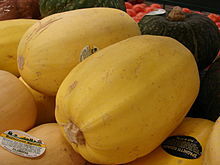 Spaghetti squash (also called vegetable spaghetti, noodle squash, vegetable marrow, spaghetti marrow, and squaghetti) is a group of cultivars of Cucurbita pepo subsp. pepo. The fruit can range either from ivory to yellow or orange in color. The orange varieties have a higher carotene content. Its center contains many large seeds. Its flesh is bright yellow or orange. 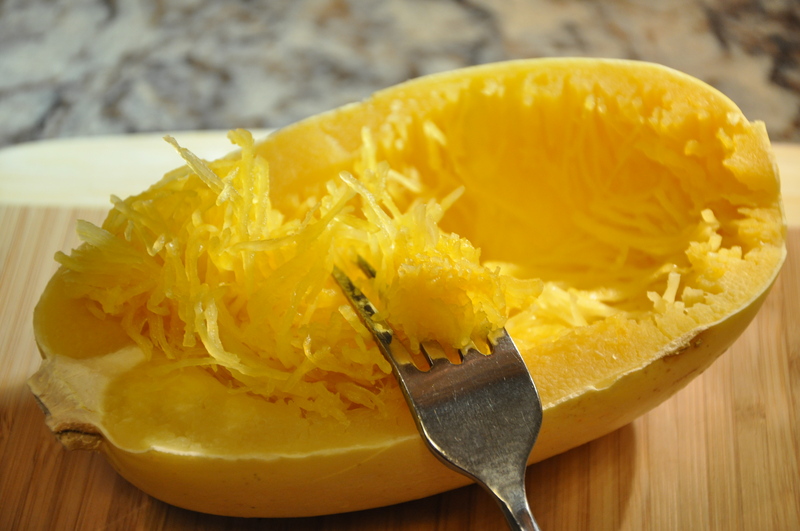 When raw, the flesh is solid and similar to other raw squash; when cooked, the flesh falls away from the fruit in ribbons or strands like spaghetti. 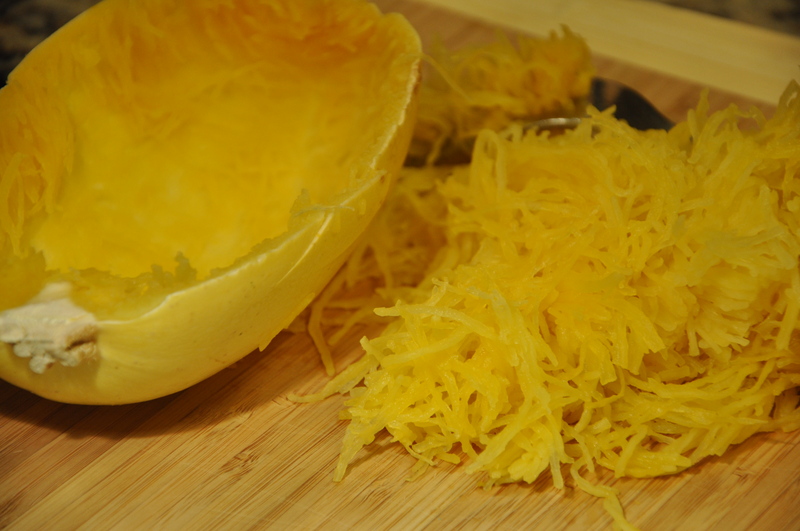 Using a sharp knife, cut the squash in half, lengthwise, scoop out and discard the seeds from center of the squash. Place squash cut side down in a microwavable pan. Add 1 inch of water to the pan. 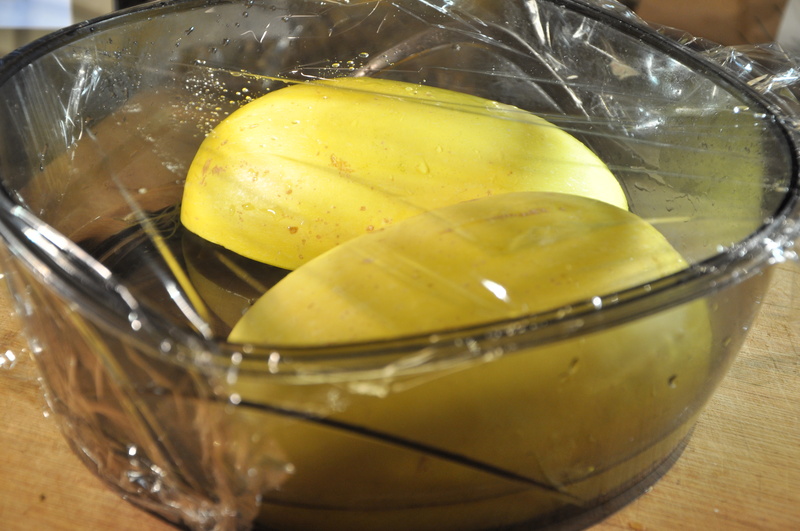 Cover the squash with plastic wrap, microwave for 10 minutes. Meanwhile, in a small skillet over medium heat, add olive oil. 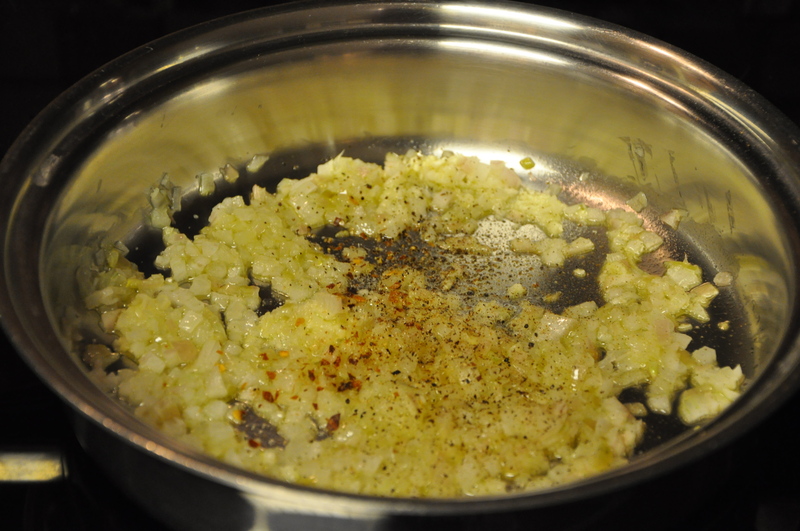 When oil is hot add chopped onion, garlic, salt, pepper and red pepper flakes (to taste), cook over medium low heat until onion is soft, about 5 minutes. When cooked, remove squash from microwave. 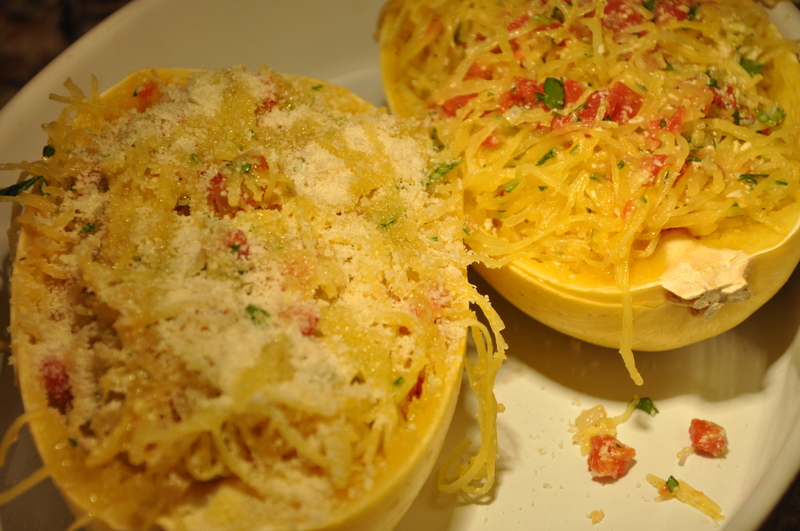 Place squash on a cutting board; use a fork to remove the strands of the “spaghetti” squash, place in a mixing bowl. 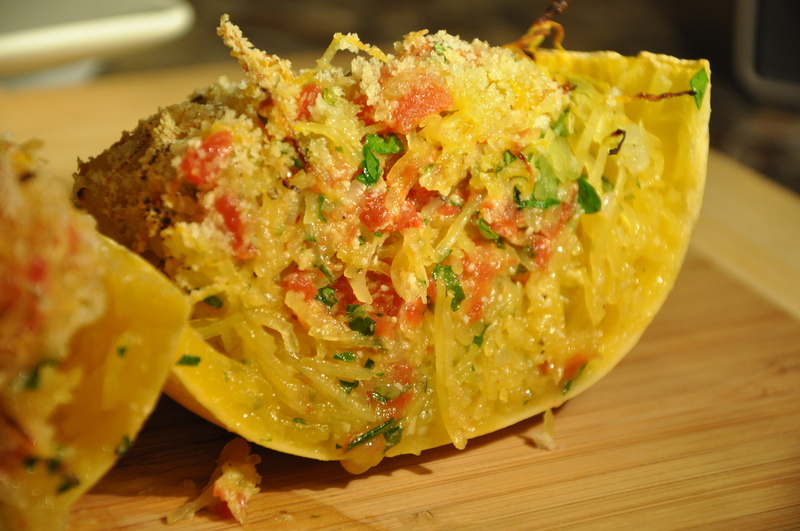 Add chopped parsley, basil, parmesan cheese, tomatoes, salt and freshly ground black pepper to spaghetti squash. Mix until combined. Fill each squash skin with mixture, divided evenly. Top each half with 1 tablespoon Panko bread crumbs. Drizzle with extra virgin olive oil (if desired). 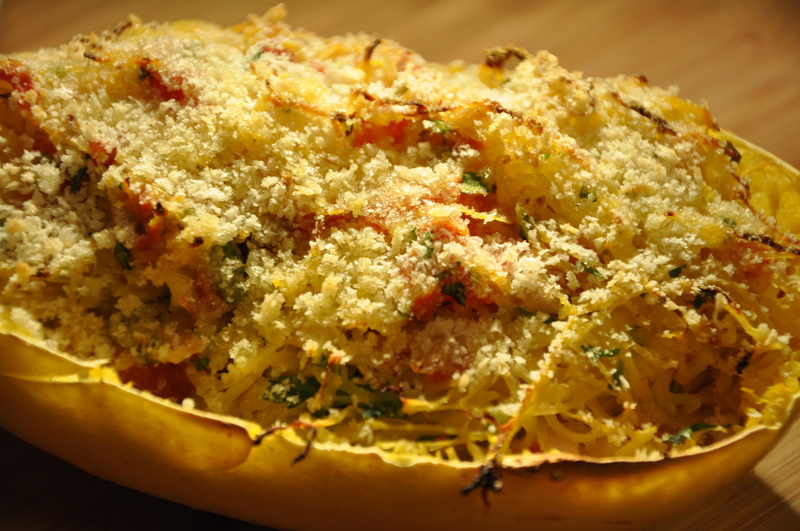 Place squash in a preheated 350° oven, bake for 15-20 minutes or until squash is golden brown. Buon Appetito!! !